1. 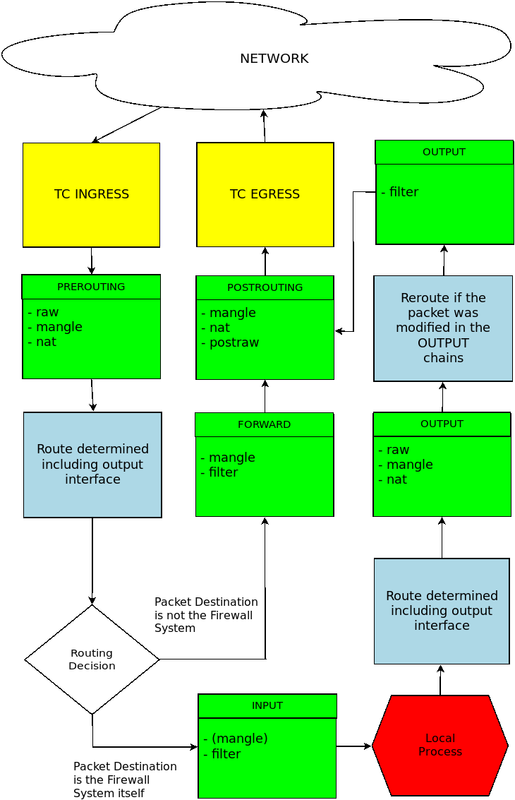 如何查詢我目前 iptables 的配置組態設定 ? 4. 使用 -j MASQUERADE 與 -j SNAT 於 NAT 使用差異 ? # the helpers are stored in /etc/modprobe.conf. 因為申請專線的 IP ( Public IP ) 數目不多, 但機房的伺服器較多, 所以若直接每部 Server 都用 Private IP ( eg : 192.168.0.0/24 ) 的話, 如何可以利用 iptable 設定進行地址的轉換呢 ? 又 192.168.0.203 為 gateway, 192.168.0.240 為 netmask ! 可以參考該討論篇內的 "如何配置連線到 NAT 主機某個對外 Port 時，可以轉送到內部某主機？"
另外, 關於 DNS ( bind 9 ) 的設定問題, 因新版提供 view 功能, 如伺服器 Server 端利用 Private IP 來代理 Public IP 的話, 那麼需要利用 view 進行區分嗎 ? 意思是否針對如 ( Web, ftp, mail, DNS ) 等等的數據包呢 ? Eth0 連接 HUB_A 與 ISP 提供的Router, 但想用虛擬IP ( 如 : 192.168.0.1 ) 代替真實IP( 如 : 202.175.123.123 ). 1, 清除 iptable 預設值 及重新設定 firewall rule ? 3, 開放需要對外之服務項目 ( 如 : web, ftp, mail , DNS ) 等 ? 4, 如何設定地址轉換 ( 虛擬 與 真實 IP 之對應 ) ? 5, 如何啟動 NAT 給 clients users 經由 Eth1 及 Eth0 上網之用 ? 另外, 請問在這個環境下的 DNS 是否需用 view 功能分隔 Internal 與 Enternal 部份呢 ? 請問是否 主機 必須 置於 Linux Firewall 主機 之後, 才可以用虛擬 IP 對外呢 ? 請問如 POSTROUTING chain 預設為 DROP 的話, 其代碼應為何 ? 請問如何可在 Fedora 11 中載入(程式碼)以下模組呢 ? vmap allocation for size 7589888 failed: use vmalloc=<size> to increase size.